If you are anything into research or even technology, you are required to give presentations. You start your degree, and are blissfully unaware of it... Until the first spoken presentation strikes. 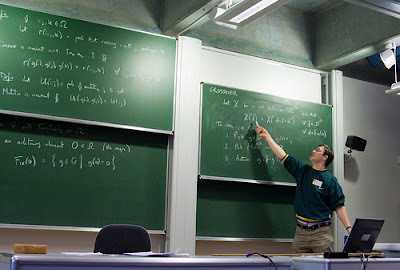 It is probably not too hard, in a slightly empty class during your degree. Then you get to your PhD, your first serious talk in front of 50 or 60 experts... And you are probably not prepared. I can assure you after reading Even a Geek Can Speak: Low-Tech Presentation Skills for High-Tech People that this is a book you should read before ending your degree, or at least, before your first oral presentation. This is the book that will teach you everything you wanted to know about talks and presentations. It covers the main topics of a presentation: preparation, technique and tips. Gives you clear advice about subjects you did not think about: your voice, your gestures, your posture. Tells you how to turn a presentation into something almost everyone can understand. There is a catch, though. It is more focused in geeks talking to management than geeks talking to geeks. In other words, it is not perfectly suited for a mathematician talking to other mathematicians. But except for this very minor point (and I'll tell you why this is minor in a few lines) this is the talk book. The book starts with a review of what you have to do to make a presentation, very quickly, before getting into more in-depth matters. Creating a good hook, preparing a wrap up and filling the dreaded in-between are the first subjects. Create a message objective: what the reader will get from your talk. Add supporting points to this message, and then add evidence to support them. And you are done! After the quick recap you get into the nitty-gritty details. Crafting a message, removing jargon, using stories and jokes and so on. Everything you wanted to know about the craft of your presentation (i.e. before the day) is thoroughly covered. Chances are, you never, ever gave a damn about how your voice sounds. Or how your whisper voice is, compared to your loud voice. Or how to modulate your voice speed. And this are only things you can control about your voice! These fine-grained details are one of the most interesting parts of the book. Mostly because they are the stuff I tend to not think about, ever. I may craft a decent presentation... and flunk it exactly because I am not aware of my voice, speed and nerves. Some tips? Record your voice and read parts of your presentation in loud voice and whispering voice. Chances are, they are very similar. Record you talking with a huge, phony smile. Chances are it will look almost natural and cheerful. Rehearse a lot. Practice the first lines more than anything else. The book is very thorough in getting your geekspeak into normal English (or whatever language your talk will be). From removing jargon to being funny, from having stage presence to being clear and thorough. Of course, there is also a chapter about making your presentation interesting. Of course, do you want it, don't you? Remove any jargon people might not understand: plain language is understood by everyone, but jargon can be specific. And don't try to be so obscure no-one asks anything afraid of your answer! By the way, now we talk about questions: prepare a brainstorming session beforehand, looking for all the questions you may be asked. Rehearse them, and you will have nothing to fear from the end of talk questions session. The book covers everything you need to know to give a rock-solid presentation or talk. Crafting the presentation, rehearsing, prepare your mind and your body for it. So far I have found nothing I missed from the book, except addressing talks from geeks to geeks. For example, when I'm giving a presentation about complex dynamics, I don't need to leave jargon out of the way. All the audience knows my jargon as well as I know theirs, I only need to forget about this point. Also, the book focuses on "selling something" to the audience. In a purely research talk you may think you are not selling anything but just teaching your method or result... Think again. In reality, you are selling yourself as a valid researcher, are selling your mind for future collaborations and are selling your result and techniques to be used in forthcoming papers. There is a lot of things you can sell, even if you are in research. Even a Geek Can Speak has even chapter covering creating elevator pitches, pitching to venture capitalists and sailing over the room in networking events. May look like very minor points, but from a shy geek point of view, they are awesome in pinpointing flaws. I absolutely recommend this book to anyone who needs to convince someone else about some subject. You don't even need to be a geek! By the way, I read the Kindle edition of the book. Although I would have loved a paperback, I found it too expensive... and I had gift certificates from Amazon, making it an awesome buy.